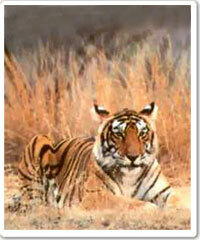 Royal Wheels India is an adventure travel group organising Kanha National Park Tour Package in India. Temperature (deg C): Summer- Max 40.6, Min 23.9; Winter- Max 23.9, Min 1.1. Best Season : April to June and November to January. Air Nagpur (266 kms) is the nearest Airport to visit Kanha National Park connected by Indian Airlines flights with Bombay. 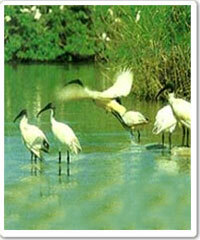 Rail: Jabalpur (169 km) is the convenient rail head to visit Kanha. Road: Kanha National Park is connected by road with Jabalpur 175 km, Khajuraho 445 km, Nagpur 266 km, Mukki 25 km, Raipur 219 km. Within the park: Koshi - Kanha (9 kms), Kishi - Katia (4 kms), Kishi - Mukki (32 kms). S.T. Local Transport: The Madhya Pradesh State Tourism Development Corporation (MPSTDC) operates a Jeep Service for vistors to go around in the park. Booking can be made through the Manager, MPSTDC, Log huts, Kisli. Wild Chalet Resorts at village Mocha, Kanha can also arrange for local sightseeing. Visitors are advised to reach the gate half an hour in advance to complete the formalities for entry into the park. 1) The Manager, Madhya Pradesh State Tourism Development Corporation Ltd., Log Hut, Kisli, Bhopal. Day 01 : Depart by train from Delhi to Jabalpur (travel in air conditioned first/ second class sleeper). Spend overnight on the train. Day 02 - 06 : Early morning arrive Jabalpur railway station. Transfer to Kanha (170 km - 05hrs driving time approx.) at your resort for five nights. 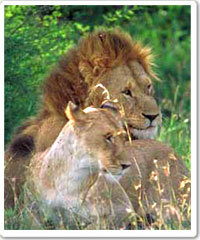 Enjoy your morning and afternoon jeep-safaris and elephant-rides in the Kanha National Park. Spend overnight at the Resort. Day 07 : Morning depart by surface to Jabalpur railway station to board your train at 1540 hrs (travel in first/ second class air conditioned sleeper) for Delhi. Overnight on board the train. Day 08 : Arrive Delhi at 0720hrs. Transfer to a hotel for day use. Later in the evening transfer to the International airport to connect your flight for your onward destination.